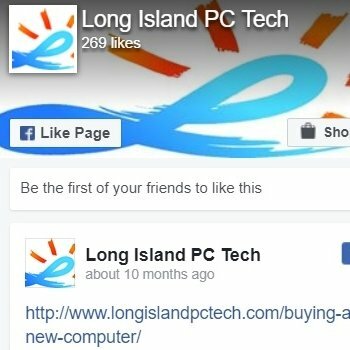 Read Long Island PC Tech reviews or Submit Yours. Thank you! I am so happy I found you!!! Thank you for recovering all my precious pictures and for fixing my work computer. Marc was extremely fast, on time, professional and very kind. I also called him a week later to design my website, and so far, it is looking amazing. What a wonderful computer repair business this is. I strongly recommend it to anyone without hesitation. I had a blue screen of death issue, hard drive, and a boot manager Windows error loop which was unending on my laptop. I thought my files/folders/pictures/photos/personal information were lost forever. Marc was not only a gentleman but also extremely intelligent when it came to computers/laptops. He drove to my location and picked up the laptop. He fixed everything in a day. I received my laptop next day and it’s running better than ever with all my files/folders/pictures/photos/personal information intact. Very reasonable pricing too. Hi Marc, we have been doing business for 7 years now, you helped my office many times, and I feel the need to write this review. You and your staff, are truly amazing! Today, our servers got infected with the ransomware and they threatened us to publicly disclose our sensitive information and documents. You stepped in, got everything back and got these criminals out of my computers. You handled it all professionally as always, and you reassured us that all was going to be okay. I thank God I found your company and you deserve all the success in the world. To everyone out there, Marc is like no others, talented and straitghforward, and runs a company with a solid word-of-mouth reputation. Thank you, thank you, thank you! I hired this company to get back my Quickbooks file which contains my company’s accounting (12 years to be precise). I was literally lost without it and could not even begin to imagine running my business without it. I had no copy and Marc was incredibly talented and informative, and recovered that file for me! Thank you so much, you saved my business and I couldn’t be more grateful to you. Worth all the money I spent and very reasonable compared to the squad. 5 stars from all angles. Long Island pc techs are amazing. Our previous IT had us on a stranglehold, he kept all of our security passwords and we could not move a finger without having to call him, we were at his mercy. Marc and his staff came over the first time, I paid a fee to assess our office, and they gave me an action plan with clear solutions so that we did not have to rely on anyone any longer. They helped us move away from our previous tech person, and we are now fully independent. Marc gave me all the credentials, no more loss of our network, no more printer and server disconnecting, and I could not thank you enough! Thank you from setting us free. 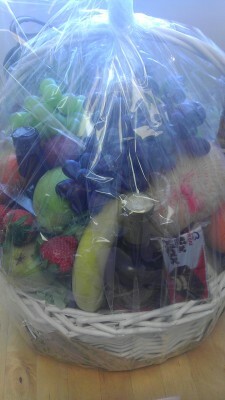 We sent you a gift basket and I hope you like it! Mary says thank you for re-arranging her wires. Marc and his crew are extremely professional. He sent us a tech an hour after calling and they fixed our network in no time. They explained everything clearly to me, pricing was reasonable and the service was blazing fast! Thank you. They are professionals and definitely the best IT company we have ever used for our offices. We have shares that keep disconnecting from our server and in less than an hour from my call, Marc sent me a tech. In the blink of an eye, he fixed our problem. He discovered our switch was dead and replaced it with a new one. This issue will not happen again for quite some time now. Thank you so much!!! Wow! 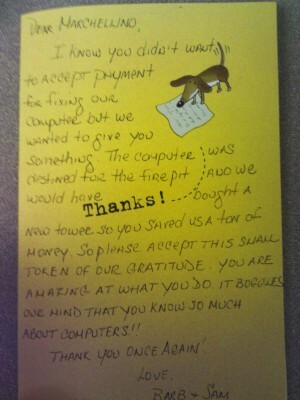 Thank you so much, you fixed all of our network problems, removed a virus and saved all of our Quickbooks files!!! We love you, and we will recommend you to all we know. Please send us some business cards so we can pass them out. Thank you again. Unbelievable service! You were incredibly helpful and you taught me so much. To think that the store down my street here in North Bellmore, was going to charge me double. You removed the encrypto virus (not sure how it is called), brought back my Windows 8 to default and transferred my pictures and with so much dedication and passion while making it reasonable for me! Thank you again and will continue to use your service. I just signed up for your blog too. Hey Marc, thank you very much for your support! You are an amazing and experienced tech. My whole office is so happy to have found you. Carol loves what you have done on her computer, and I couldn’t be more satisfied. We will recommend you to all, this is a big building and I will make sure to give them your company’s phone number. Thank you! Thank you so much Marc! You solved it all, my wifi, my mac, my windows laptop and my daughter’s iPad. You are a multitalented person and love your service and professionalism. I will recommend your company to everyone I know! Fantastic service! Truly phenomenal. I went to Staples and Bestbuy and both wanted to charge me a diagnostic fee for each one of my two laptops. They also told me I had to wait 8 to 10 business days to get these back. However, Marc came to my house 30 minutes after I called, and fixed both laptops by the evening. I was astonished. Reasonable price, excellent communication and punctual. You deserve it, thank you very much! 5 STARS TO YOUR COMPANY! I had two old computers and one new laptop. You fixed all of these for me and now I have three new computers! I will definetely consider all of your services, you are a wonderful, skilled person and your techs go above and beyond. Rare, very rare. Thank you! Wow! Fantastic service and skills. You solved our issue over the phone in 60 seconds. Then you came to our office and fixed our network which for so long has been a nightmare. best service that was provided! !, thank you. repaired my laptop with just a few steps. Great experience ! Tried doing my site with 2 other web designers and wasted a lot of money. We now have a Class A+ web store. Mark was right on target with all his work and very reasonable price. I wish I had found him first. Marcello was extremely efficient in setting up my new computer and very helpful in answering all my questions. Fast, reliable and a pleasure to deal with. I would highly recommend Marcello for all your home and business computer needs. When my old Dell Dimension 3000 (more than 8 years) failed to boot up I went into panic mode. 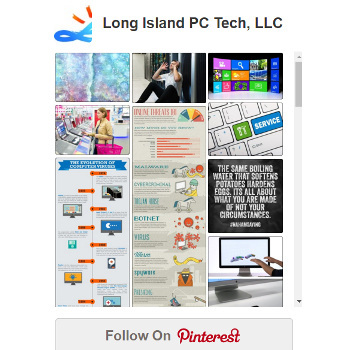 Then my wife researched techs online and told me that Long Island PC Tech looked like the real deal. Marc (Marcellino) came to my house full of helpful knowledge and explanations, which inspired considerable reassurance and confidence. Although there was no reasonable way to make my old computer young again, I did buy a new Lenovo computer from him, which he quickly installed and explained. It’s really great having Marc to turn to with whatever problems come up. Hey, thank you! It all works, my printer, my fax, my Surface tablet and both of my computers. It’s shocking what this guy can do, especially with the remote connection, I still can’t believe it. I got so scared when I saw this popup on my computer asking me for money. you came and told me this was the fbi virus – I gotta say I was a bit skeptical at first, I did not understand how you could make my computer work again. You made me laugh when you said: “I will go in from the backdoor” and I said “what backdoor, I got no backdoor!”, lol. When you showed me how, I was surprised and still am, truly, you are so talented! You got rid of this thing and you made me super happy. I will refer you to my friends, guaranteed! Thank you. You fixed all of our network, set us up with the cabling and did it all professionally and on the same day we called. You will always be our IT! Thank you from the staff too, oh… and for the free monitor. This was a gift basket. Thank you to these wonderful clients from us! Wonderful, trustworthy and got the problem fixed and up and running faster than ever,,thank you very much and I will be passing your name around to anyone looking for computer help. Thank you again!! Best service ever!!!! Very thorough and efficient. I am extremely happy with his service and would highly recommend him to others. Marcellino was so great to work with……..not only did he revamp and update my quilt website- and it looks fantastic!!! – he also taught me how to manage the website. Marcellino is very knowledgeable and had great suggestions! Gracias por toda su ayuda ,y por la paciencia cn su geante le agradesco otra vez por su ayuda y por el tiempo gracias amigo Marcellino! Thank you so much for fixing my computer! I will tell everyone about your service, appreciate it. I will fix your car when you need it and give you a big discount! I am extremely happy with the service that Marcellino provided me with my computer. He is amazing with this technology not only that but he knows exactly what he is doing i would recommend Marcellino 100% Thank you so so much for helping me out with my printer you are the best!!! I love this company of yoursMarcelino! You fixed my laptop in 30 minutes, you found the virus and removed it right away, no wasting time. You are the one and thanks for the free lamp and the flash drive, I appreciated it very much. Lots of success! Marcellino did a terrific job organizing my hard drive and adding an external drive. He was quite professional and explained everything in language I could understand. I am very happy with his work and would not hesitate to call him when I have any other problems. Marcellino was quick to respond to my call for help. I would highly recommend him to anyone who needed help with their computer or programs. Just wanted to say thank you! You took care of my computer and my mini laptop. They are both excellent and am impressed. I will recommend your service to everyone I know! Thank you very much for all your help. You are extremely efficient are very good at what you do. I’d be more than happy to recommend you to other people. Thanks again! Came to my house well prepared with everything and looked at my computer, checked if my computer had any viruses which it did a lot and completely wiped them off. Was very polite and explained to me what the type of viruses my computer had. I really enjoyed the service and will be a regular customer . Thank You, Jairo J. Thank you so much, you were precise, polite and my computer works really well now! Thanks for the beautiful laptop led lamp, I was surprised you gave it to me for free, what a nice gesture that was! You installed my wireless internet very quickly, then you checked my computer and am so glad you did! You removed 8 trojans which I had no idea were there and how these got into my computer. You explained me the importance of an anti-virus, you were very polite, professional and did not charge me a fortune either. You are the Pc tech of my family now, thank you! Excellent!!! That is all I want to say to you. I thought that was no more chance for my old computer, one guy told me it was a very bad virus that made it turn off suddenly. That guy ripped me off! took $85 just to look at it and told me I needed to reinstall and wipe everything. I know nothing about computers but it felt really wrong. And matter of fact you explained me that it was overheating and had nothing to do with a virus. You fixed it, you were honest and I thank you very much from the bottom of my heart. Much more success to you my friend Pc Tech! Thank you again for fixing my laptop, i am very happy because you did an amazing work on my laptop. Thank you again! My internet was not working anymore, done and gone out the window! I called you Marcellio, you came to my house on time, you spotted the problem in three minutes, phenomenal! What was even better than that is that you only took thediagnositic fee and did not charge me anything to solve my problem. I was left speechless, you left me your business card and gave me a usb flash drive for free when I asked where I could buy one to store my pictures, am amazed! Thank you so much for your kindness and knowledge and wish you much more success!!! Okay, first thing I want to say you did it and you are the man! Everyone that looked at my small laptop told me it was the motherboard, they would all say it’s your motherboard, it’s dead, one tech wanted to charge me $345 to repair it, I said no, you are crazy! You, Marcelino are the only one that resurrected it, it works so fast too I don’t believe it. The most important thing is that I can continue writing my book now and nothing is lost. Thank you from my heart! Thank you so much Marcellino, I really appreciated your help. I went to a big computer shop next to me here on Westbury before choosing you and they wanted to charge me $95 for each 10 gb of data recovery. I was shocked to hear that it would cost me a little more than $300 to get back all my videos and pictures, crazy!!! You did it for half the price, fast and with kindness! My friends and family will come to you if they have problems with their computers, I can assure you :). This guy is really good. Very honest and realible. Ive been problems w laptop for a long time. I bring my laptop to get checked by two tech but results it was not satisfactory. But Marcelino he fixed in couple hours. I have used a lot of different computer help companies over the years. I always got very frustrated in the past because they would take too long to return phone calls/emails and when they finally did they wasted my time because they could not fix my problem. I am sooo happy that I found Marcellino. I now know that when I have any computer problem at all I not only get a very quick response, I get a solution to my problem everytime!! I now use Marcellino for my entire family’s computers. 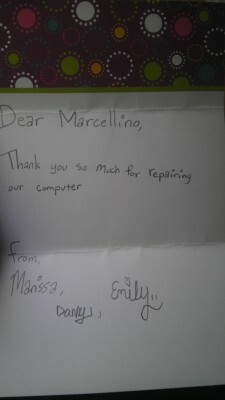 Marcellino’s computer repair service does what no Best Buy/Geek Squad will never do: tell you the straight issues and best/cheapest solutions available. His passion and knowledge for the practice continue to grow with each task given and he truly cares for the work. He identifies the issues with your hardware/software as quickly as a possible and provides several options as to how to alleviate it. My Acer netbook (old/obsolete, i know, but still useful) one day just stopped being able to connect to my wireless signal. i researched the issue and was only brought to plug-in download pages. i brought it to Best Buy/Geek Squad (where i purchased) and once again, as they have before, told me that it was a minimum charge for plug-ins and then overnight hard drive repair. I brought the same computer with the same issues to Marcellino. Not only did he have it fixed for a fraction of the cost, but he was finished in less than 12 hours. in addition, he explained what actually went wrong, and should ti happen again, how to fix it myself. First of all thank you so much for your kindness, that’s the first thing that impressed me. Second, every Pc tech I spoke with had either an attitude like they were doing me a favor or wanted to charge me more $300 to take a virus off my beautiful SonyVaio laptop which has always worked great until three days ago. Third, I don’t know what exactly you did to it to remove it but it is just perfect and better than when it was new. Thanks a lot, I appreciated it and for anyone out there, this guy is the one! My computer was dead and I want to thank you for your great service! You are polite, were punctual, and my computer is back on. I paid the least possible for a good power supply thanks to your honesty and Amazon. You are on my list of favorite businesses and people. Thank you. It took you more than two hours, I thought it was going to be faster but I have to say my internet works again, microsoft word does not give me the run time error no more, and yes you fixed my backup software too. Thank you, I will call you again. Well, I am happy I found you! I was going crazy finding a good cheap laptop with all the mixed reviews online and talking to you did it. Thank you Marcellino for helping me with my gateway laptop, it’s fast and back to what it was when I bought it. I will refer your service, mark my words! Fly back to the top.